It's easy to make your own baby sling with these free baby sling patterns. But first, you'll need to choose your fabric. You may also want to read about a tapered baby sling and you'll want to see these cool options and ideas so that you can plan to make the best baby sling. There are a few things to consider when choosing fabric to make your own baby sling. The first is safety and fabric strength. You will still be able to use your sling for an on the hip hold until baby is a toddler and becomes too heavy to carry, so the sling needs to be very strong and safe. The good news is, that you can select a lighter weight fabric as a liner and pair it with another fabric to add the extra strength. Your design and fabric options are limitless when you make your own baby sling! The second thing to consider when choosing your fabric is warmth. Consider the seasons and temperatures, as well as your own personal thermostat. Wearing your baby will add extra snuggly warmth as well. For my first sling, I used a gender neutral combination of turquoise fleece and a pretty milk chocolate colored silky jersey knit. My husband and I could both wear the sling, and it kept my January baby toasty warm! Other considerations to keep in mind when you make your own baby sling are to choose a fabric that will compliment the style of the parent: are they very casual, or more fashion forward? If Mom and Dad have a similar height and build, I like to make a gender neutral sling that they can both enjoy. Remember that a baby sling needs to be wash and wear. My favorite fabrics have a bit of stretch. I also love fabrics that don't hold wrinkles, as the sling gets rolled and stuffed into my purse or the diaper bag quite often. Home Decor Fabrics come in a great variety of patterns, and are a nice weight of cotton...perfect to make your own baby sling! Home Decor Fabrics: these are a canvas weight, and come in some really wonderful patterns and colors. Some may be 'dry clean only', but you can test wash a swatch. Definitely pre-wash if you get 100% cotton. Great colors & patterns, but usually no stretchy fabrics here. Denim: Especially with a bit of stretch in it. See the notes for stretch fabrics. I love denim, as it's unisex and goes with most of my casual wear. Khaki (and other colors of cotton canvas): These are the weight of denim, and come in a variety of cute solid colors. Wool plaids, Courdouroy, and Suiting Fabrics: are other good choices. Just keep washability and fabric strength in mind as you shop. My fabric store has the best selection of heavier stretch fabrics in the fall. 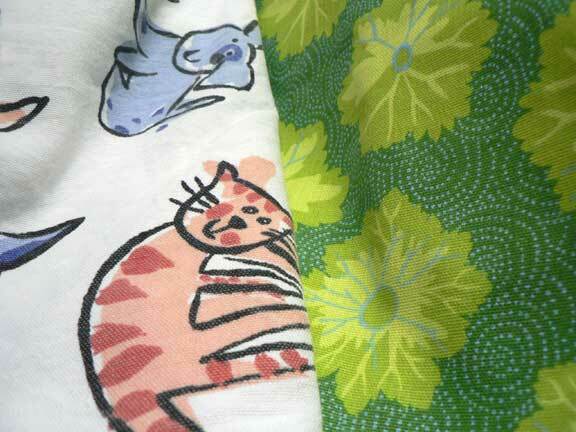 my favorite fabric combinations to make your own baby sling...Super cute & reversible! You will need about 2 yards per fabric type that you plan on using. You can't go wrong with this classic combination. A yellow gingham would be a great gender neutral choice. This is such a fun combination. One side is fun and casual, and the other side is a little more dressy and fancy. Tons of fun combinations are possible with a classic denim sling and the fun prints in your quilting department. Blue and red are a classic color combination. 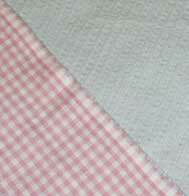 The gingham reminds me of Raggedy Ann & Andy. Red bandana would be a great choice for a little cowboy. The white eyelet is so pretty for the summer, while the colored side can be used year round. 100% cotton canvas adds strength without being too hot...just be sure to pre-wash before making your sling. This is a sizzling and sassy combination. The satin makes it easy to slip baby in and position her in the sling, but it does get warm. This would be great for a winter baby. This is the perfect combination for an everyday, gender neutral sling that will go with anything. Even Dad will be proud to sport this sharp baby sling pouch. This is a great combination for outdoor or winter babywearing. When using a stretchy fabric, such as fleece or knit, there is always a stretchier edge. Be sure that your fabric is more stretchy across the width than it is across the length. A tapered sling gets narrower toward your shoulder. Most of the popular slings on the market today (like Peanut Shells and New Native baby slings) aren’t tapered, with the full width of fabric on your shoulder. The baby sling patterns on this site show a non-tapered pouch, which does offer fuller coverage for you and baby. But I have also included instructions on cutting a tapered pouch with each pattern. (above) A tapered reversible sling in pistachio and purple shirting. This sling was made using this free baby sling pattern, and features a monogrammed flip pocket, with a coordinating monogrammed tote bag. The Flip Pocket: On some of my slings, like the one pictured above, I've made a simple pocket that is sewn into the long seams. I call it a 'flip pocket', as it can flip to the outside of the sling, or to the inside. It's just the right size for a passie or your keys. To make it, I cut a rectangle of fabric to approximately 6 inches by 20 inches. Fold it in half with the right sides together so that it is 6" x 10", and stitch up the long sides. Turn it right side out and press. Lay it flat with the unfinished opening at the top. Fold up 4 1/2 inches to create a little pocket, and stitch down the sides. You'll pin the raw edges into the long side seams of your lined sling, close to your curve cut, and just catch the unfinished flap on your pocket into the long seams. It's so much fun to get creative with the details when you make your own baby sling. You can add special touches like sewing ribbon trim or running decorative stitching along the side seams. Iron on patches, rick-rack, and iron-on initials are also cute additions. Just remember that the finished sling should be washable. I love the idea of adding a little pocket when you make your own baby sling. 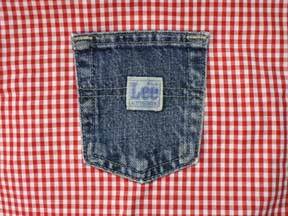 Here is an example where I've cut a pocket off of some old blue jeans, and top-stitched it onto the lining fabric. If you are making a reversible lined sling, then you'll want to hide the backside of your stitching. To do this, stitch on any embelishments to one layer of fabric before sewing your pieces together along the sides. I've also make simple drawstring bags for some of the slings I've given as gifts. I folded my finished baby sling, and measured it, adding a couple of inches at each side and about 4 inches at the top. Cut out your bag so that one of the long sides is on the fold of the fabric. Fold over the top and stitch down a channel for your drawstring or ribbon to go through. Then fold right sides together, and stitch up the bottom and side. Thread a ribbon through, and you've got a custom tote bag! Are you ready to make your own baby sling now? Find the baby sling patterns here.